I’m on a low-sodium diet to prevent complications from migraines. I’ve been on it for over a year now and have found a whole new world of food and flavor that I ignored back when I could just grab a burger at the closest drive-through. What I miss the most, though, is Mom’s famous enchiladas. I’m half-Mexican and we would make these at least once a week. Now it’s been over a year since I’ve had them. But here’s the catch: not only can’t I have high salt, I can’t eat dairy or onions. I’ve found a great cheese substitute (Linsanatti’s soy cheese) and I can have scallions and green onions. I’ve seen your skill with recipes. Can you help me out? Or am I stuck never eating Mom’s delicious enchiladas again? Well, Cindra, my answer to your question is loud and clear: you can make your Mama’s Enchiladas and eat them too! Of course, you’ll have to make some nifty low sodium substitutions, and make a lot of things from scratch, but it is entirely possible to make the dish with all the familiar flavors and without the salt. This Monday, armed with a few spare hours and a hankering for Mexican food, I took to the enchilada challenge. Other than the onion and red pepper flakes, everything else contained a high amount of sodium and needed to be replaced. To make-over this recipe, it was clear we needed to stay away from canned products and make similar ones from whole foods. Now, I must confess, I took creative liberties with this Salt-Free recipe. I didn’t use cheese, I didn’t make gravy, and I didn’t use the red sauce. But I I stuck to traditional flavors and textures, and I aimed to achieve them with as little effort and clean up as possible. Food can be homemade without being a hassle. So with fingers crossed and an apron tied on, I began to craft a crispy dish that blended creaminess, crunch, and spice in perfect harmony. Normally, I would have reached for crème fraiche or ricotta to a mimic the cheese. 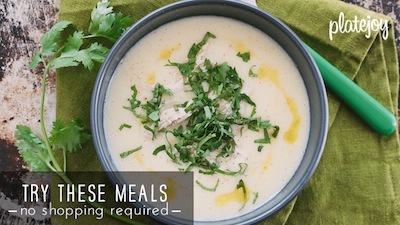 But because of Cindra’s dairy sensitivity, I needed to think of another way to introduce a milky texture to the dish. The answer was corn. I puréed two cups of kernals with a medium sized avocado. This thick, but silky spread acted as a “melted cheese” substitute while also providing a scrumptious, unexpected flavor. 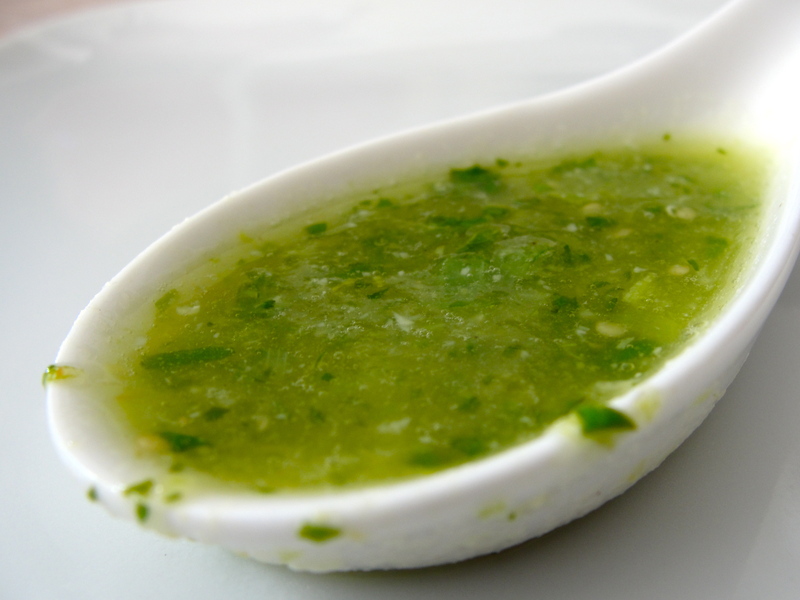 For the sauce, I made a salsa verde from tomatillos, a poblano pepper, a serrano pepper, and some cilantro. With an immersion blender in my hand, it took only minutes to whip this up. As for the meat filling, I wanted to make sure my chicken was infused with deep flavors. But I also wanted to be able to cook it quickly. So I poached the thighs in a pot full of Tecate (no joke) and the juice of one lime. In thirty minutes, my chicken was drunk and tender enough to be shredded. Finally, because corn tortillas (without salt) are not as pliable and tend to fall apart easily, I chose to layer the ingredients like a Mexican lasagna rather then roll. Again, I was clearly taking liberties with the classic preparation, but I think the alteration works well and you still achieve the hug of crispy tortillas wrapped around the ingredients. Fifteen minutes in the oven and Mama’s Enchiladas were done. Crunchy, creamy, and spicy – the meal was familiar and filling. And I hope you, Cindra, find it to be as delicious as your Mama’s version. Truly, you can recreate any dish without the salt and most of the time, the restriction will lead you to more adventurous, tasty discoveries that will not only satisfy your craving but will also impress everyone else. 1. Turn oven to 400 degrees. 2. In a medium sized pot, bring beer, juice from one lime, and two cups of water to a boil. Add the chicken thighs and cook for 5 minutes with strong bubbles. 3. Reduce heat to medium and allow the chicken to simmer for another 20 minutes. 4. In a separate pot, heat the olive oil and sauté the garlic for 5 minutes. Add the tomatillos and 1 and 1/2 cups of water, and bring to a boil. Cook until the tomatillos have softened, about ten minutes. 5. Add both peppers and cilantro, and cook on low heat for another 5 minutes. 6. Take the pot off the flame and use an immersion blender to blend the ingredients. You can also transfer the tomatillos, pepper, and water mixture to a standing blender. Purée until the combo is liquidy, but still chunky. If the sauce seems to thin, put it back on the stove and simmer on medium high for 10 minutes to reduce it. 7. In a pot or a tall cylinder, combine corn, avocado, and 1/2 a cup of water. With the immersion blender (or a standing one), mix ingredients until you have created a thick spread. 8. Take the poached chicken off the stove and out of the pot. With two forks, pull the chicken apart until it is shredded. 9. Now for the fun: in an oven safe dish or a cast iron skillet, begin to layer the ingredients. Start with tortillas (tear in half to fit your cooking vessel). 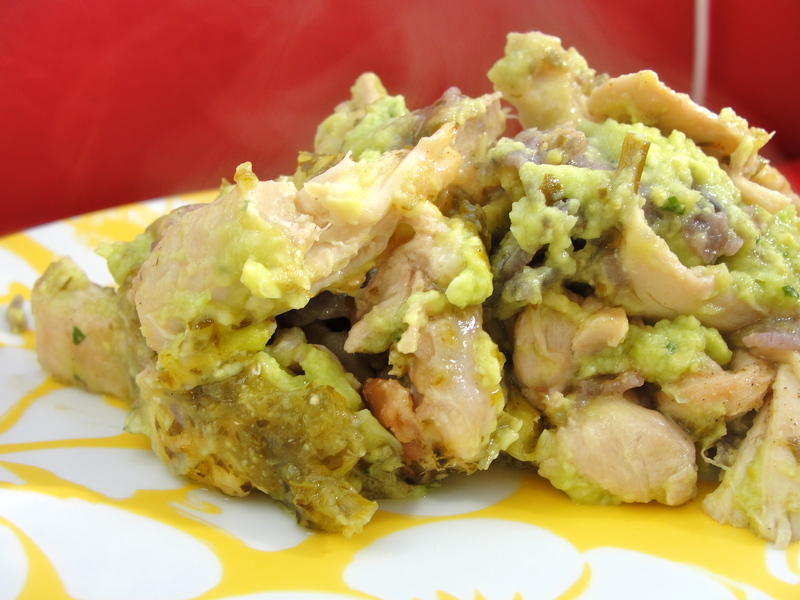 Then cover them with half of your chicken, half of the avocado/corn cream, and a generous drizzle of the salsa verde. 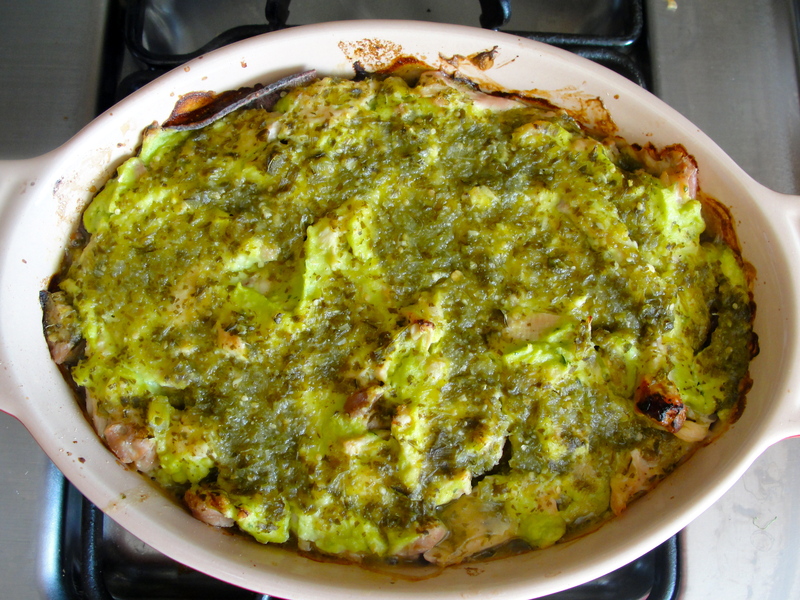 Repeat with a second layer – tortilla, avocado/corn cream, and generous drizzle of salsa verde – and throw into the oven for 15 to 20 minutes. 10. When the enchiladas are hot and crispy, remove from oven and scoop big portions onto plates. Enjoy. Thank you SO much! I will buy the ingredients tomorrow and try this out this weekend. I am so excited! I used to make enchiladas all the time and have missed them terribly, but between the sauce, the onions, and the cheese I was at a total loss. I’ll let you know how it goes! I am sitting here with a big plateful now and these are FANTASTIC! Thank you again! Seriously, you have cured a little piece of homesickness. I’m so glad you like them! 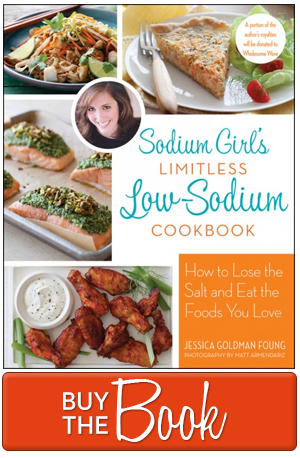 Let’s talk turkey over these next few weeks – want to take down the challenge of low sodium Thanksgiving with me? I got so hungry after reading this recipe. To combat the cravings I made a meat-free casserole with sodium-free chili beans topped with chopped onion and red pepper. Then I poured corn bread batter mixed with frozen corn over the top. Baked it 30 minutes. To my palette, which has been free of real Tex-Mex for over 10 years, it tasted almost as good as I imagine yours does. Thanks for the inspiration. We don’t use alcohol. Do you have any suggestions to replace the beer? Absolutely! Switch out for plain water, or water with a little citrus juice in it (lime, orange, lemon). Or even through in a dash of apple cider vinegar will add a bit of spice. Or if you have leftover juices from roasting tomatoes, go ahead and blanch your chicken in that. Give it a try and let us know how it goes! Glad I found this site. I have started to eat a salt free diet and am still trying to figure out how to cook all over again. I did spaghetti and chicken tacos but I need help. I have found that salt make many people great cooks but the trick is what happens when you can’t use salt anymore? Please keep sharing your tips with us! 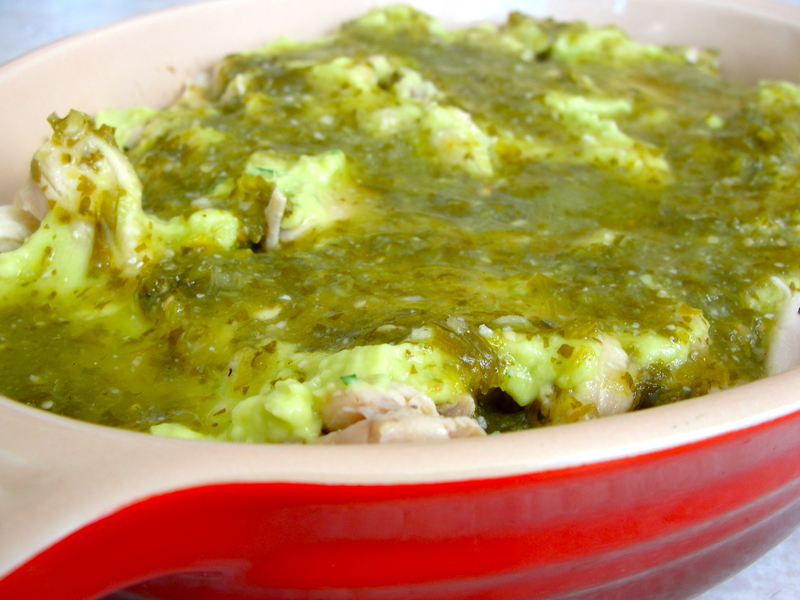 This turned out great, but used our own low-sodium salsa instead of salsa verde. Thanks for the delicious alternative to regular enchiladas! Love the recipe! I’m kind of a wuss and the salsa verde was hot so I’m able to save some for my next batch! Very tasty dish!